Heather Draper and daughter in home. Photograph by Jared Sych. 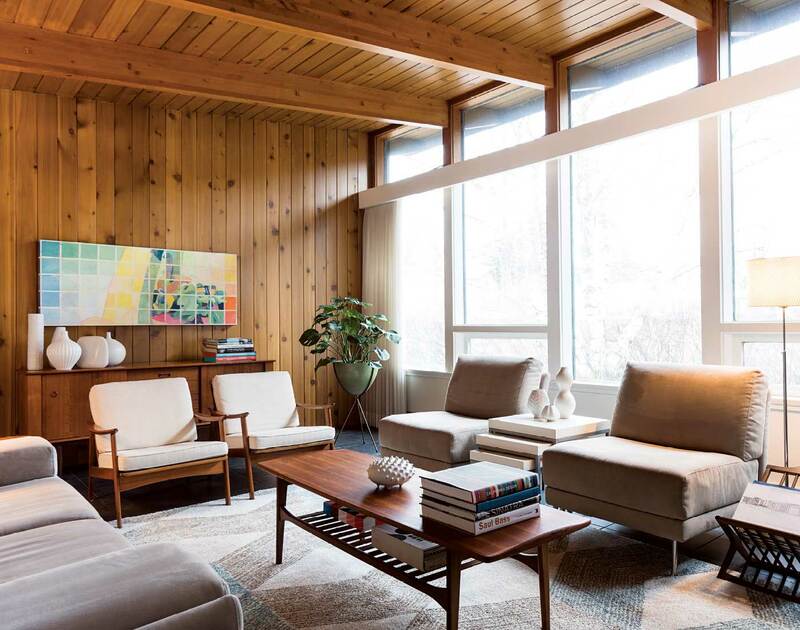 Long before the Danish concept of hygge or coziness became a decor buzzword, people wanted their houses to feel homey and welcoming — not only for guests, but most importantly, for themselves. It can seem like a no-brainer — you just move in and plunk all your stuff in place and you know, live there, and it just becomes home through time and habit. And yet, we’ve all been in houses (and apartments) that just don’t feel welcoming and settled, even though the inhabitants have been there for years. What is that magic that takes a space from being merely a place in which you live to being a home? Buying too big also feeds into another problem that can make a house not feel homey: there’s no budget left to furnish and decorate. 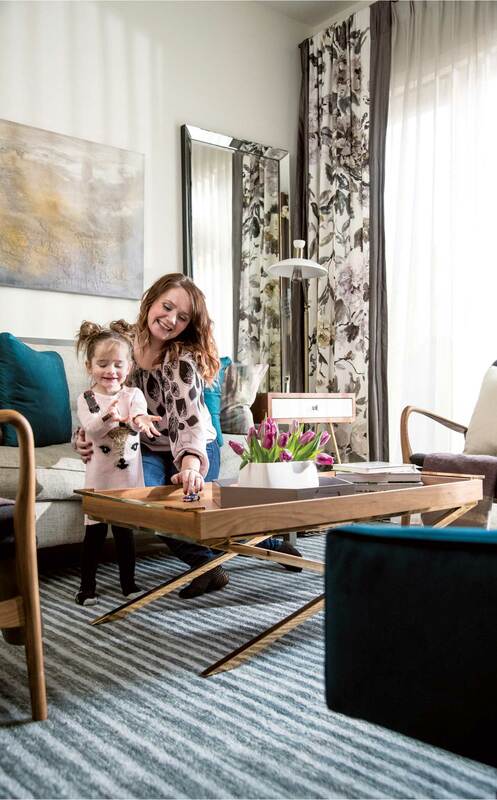 Heather Draper, principal designer and owner of The Heather Company, says she often finds people don’t anticipate the costs of furnishing their home. “You should plan to spend about 10 per cent of the value of the home on furnishing and decorating. Wouldn’t you rather have 10 per cent less house and two years down the road you have your dream home instead of having it feel like you still live in someone else’s space?” she says. The book What’s Wrong With This House? A Practical Guide to Finding a Well Designed Sustainable Home, which Brown co-authored with Matthew North, advises readers to look carefully at many aspects of the home that buyers and renters often overlook. In addition to the location and orientation of the home itself in the city, and the space inside the home, look carefully at the layout, the flow of traffic and the way things work in relation to one another. Is there space for storage and somewhere to sit in the entryway? Is there a natural place for a dining table or eating area? Is the layout of the kitchen functional and well proportioned to avoid unnecessary movement while cooking? Is there enough storage space and room to circulate, but not so much space that the house will be hard to maintain? If the answer to all of these questions is yes, then the space is more likely to be one you can make homey. 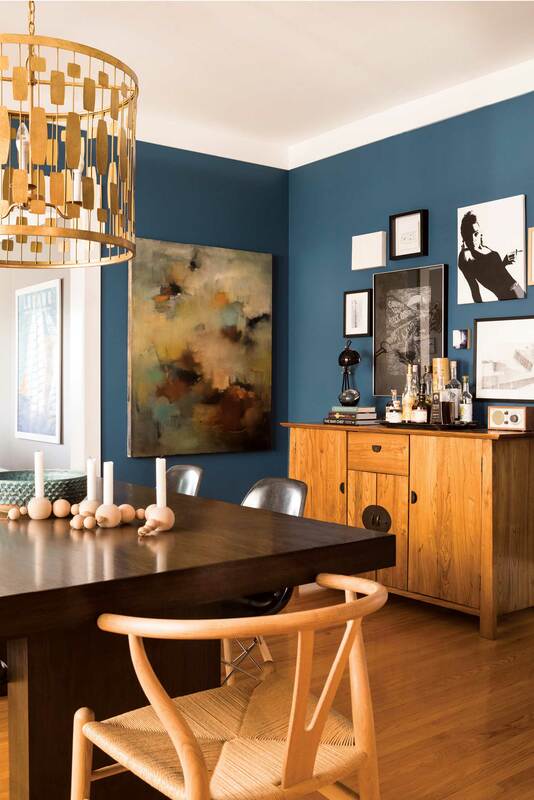 Designer Sarah Ward personalized her dining room with colour and artwork. Photograph by Jared Sych. Once you’ve selected a space, the next aspect to making it “home” is personalizing the decor. “Nothing makes a house feel like a home more than making it reflect the people who live inside,” says Draper. She says personalizing starts with things like painting the walls your preferred colours and selecting draperies and finishes that reflect your taste. Some changes, such as finding and installing new light fixtures and painting may not be as costly as you think and can have big impact. 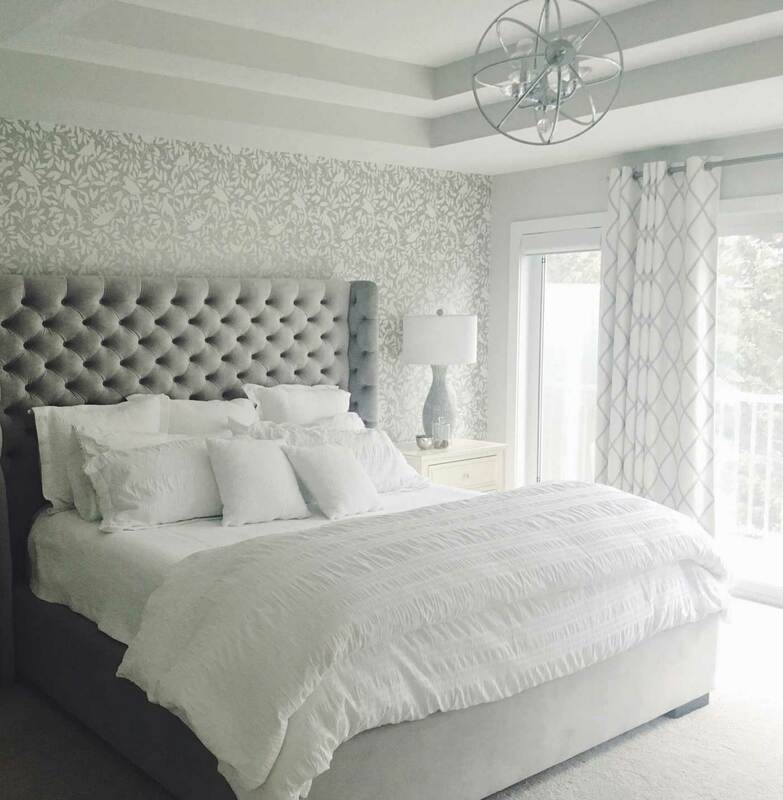 The interior designers and decorators from Country Living Furnishings and Design refer to this as finding your “style personality” and they work with clients to articulate that personality and often, to combine or layer it with a spouse’s personality. The designers at The Heather Company emphasize that creating the look of a personalized space takes time and attention, in part because it usually entails layers rather than buying matching furniture. Going out and finding unique pieces that speak to your own style can take time. In fact, according to a recent survey of 2,000 American adults commissioned by the furniture company Article, it takes an average of 216 hours to find the perfect home furnishings. But the payoff is big. “You want your house to feel like a home, not like you’re living in someone else’s space,” says Country Living owner Rhonda Fairhurst. She notes that the look of a truly homey space is also very different from the look of a show home, which is created to be inoffensive to everyone. A home should appeal to you and your taste. 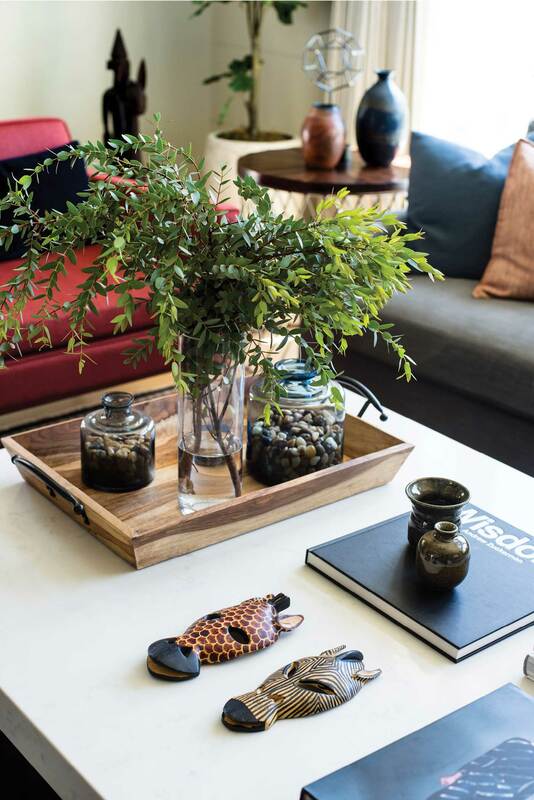 Meaningful accessories collected over time, like those displayed in this livingroom by Alykhan Velji Designs, created a layered and homey look. Photograph by Jared Sych. For Draper, the key is in finding pieces that you love or, in her words, that “haunt” you — those furnishings and accessories that you are still thinking about days after you first saw them. “Go exploring in some of the smaller shops in town and if you see something that you just love, that’s haunting you, that you wake up the next day thinking about, then it doesn’t matter what it matches because beautiful, wonderful homes are in evolution and inevitably the things you love will come together because they are unique to who you are,” she says. Not everyone, nor the people they live with, is patient enough for this evolutionary design approach, though. Adding original artwork and meaningful accessories can personalize your space quickly. Whether it’s from an art gallery, an heirloom piece, something you found on your travels or a piece picked up at a garage sale or a student show, original artwork that speaks to you is an amazing way to instantly add personality to your home. Accessories can add personality as well, as long as they are chosen with care. Mass-produced tchotchkes selected without thought lined up on a shelf are unlikely to make the space feel like your own. “Accessorize with items that have meaning to you. It’s about meaning, not volume,” says interior decorator Cat Hackman, principal and owner of Room4Refinement. There is also a line between displaying meaningful mementos and having a house full of clutter. While a few items on display will personalize the space, too many can feel chaotic. For Draper, where to draw that line between display and clutter again goes back to the things you love. “It becomes clutter when it’s not things you love. So if it’s a vase that somebody gave you that you feel like you have to have on display, just know that you don’t,” she says. Hackman notes that people often feel bad about getting rid of things that were expensive or that were gifts or family heirlooms. “We often feel guilty. But you really need to look at what you love. It drains you to have clutter,” she says. Allbright suggests starting with things you aren’t attached to. For those things you just can’t part with at first, try boxing them up, labelling them with the date and if you haven’t looked for them once an agreed time has passed, then get rid of the boxes without opening them. Give them to charity and feel good about your unloved items going somewhere they’ll be more appreciated. And if you really can’t part with your clutter, consider putting it in storage seasonally. Interior decorator Cat Hackman says creating a welcoming home starts at the entrance. Photograph by Philippe Clairo. In addition to feeling personalized and well organized, the public spaces of your house should be set up to welcome you and your guests. Creating a welcoming feeling starts outside your front door. “You can tell if people care about the look and condition of their home by the front porch,” says Hackman. If your porch is untidy, unswept, dilapidated and unwelcoming, it sets the tone for your space. Refresh or even just clean your outdoor light fixture, sweep the porch, put out seasonal plantings or pillows on the seating. Inside, making your house feel welcoming for guests means keeping appropriate psychological distance by not having family photos all over the place but also by creating physical spaces that encourage connection and conversation. Hackman sees a lot of houses that don’t have adequate conversation space, or where furniture doesn’t face each other or has been pushed to the edges of the room instead of being grouped in easy conversational clusters. “If you can’t sit down and have a cup of tea and a conversation, you’ll notice that,” she says. A comfortable place to sit, near a spot for one or more others and with somewhere for everyone to set a drink will help make your house feel more welcoming and help conversation flow. Welcoming spaces have seating positioned for conversation and a place within reach to put a drink, such as this living room by Michael Kurtz of Under the Roof Decorating. Photograph by Jared Sych. Hackman also finds that many living rooms are oriented toward the TV, which is inherently unwelcoming and stifles conversation. “The TV is always an issue. If you can not have a TV in the living room, that makes it more cozy,” she says. The team at Country Living talks a lot about multi-purpose pieces and furnishings that can be called in for extra duties as needed — such as an extendable table or ottomans that can be repurposed as stools for that large dinner. Soft textures and warm lighting help to make this room decorated by Country Living Furnishings and Design feel cozy. Photograph by Victoria Chern. While creating a truly homey space is about more than just creating coziness, the two aren’t unrelated. Soft, textured finishes help a space feel welcoming in a few different ways. First of all, they look warm and inviting. “When a home doesn’t feel cozy it’s often because of the lack of textures. 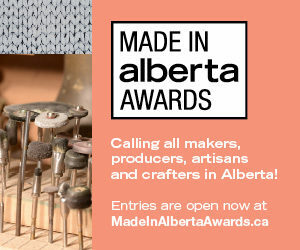 Textures add warmth and interest,” says Hackman. Soft textures also provide acoustic softening and stop echoes. When there are lots of hard surfaces — flooring being one, but also leather upholstery, glass and metal tables and light fixtures — sounds echo in a space, making it feel emptier and less welcoming. Using softer textures, including area rugs, draperies and fabric upholstery, will make your room sound as well as look homier. “Drapes and a good area rug are also going to make your sound system sound better, too,” says Draper. Lighting should also be soft. Changing harsh white bulbs for softer, warmer lights that mimic candlelight will make the space seem like a home rather than an industrial space. If you’ve put time and a bit of effort into thinking about the flow of the space and the placement of the furnishings, and you’ve decorated with intention and highlighted things you love, that’s going to come through. But being at ease in your space, where there is neither too much clutter nor an overly rigid feeling of perfectionism isn’t just a decorating issue, it’s a psychological issue. In many ways what makes a home feel welcoming is that it actually is welcoming and the people who live there are comfortable with themselves and ready to have guests arrive. Having a simple organizational system helps teach kids good habits from an early age. 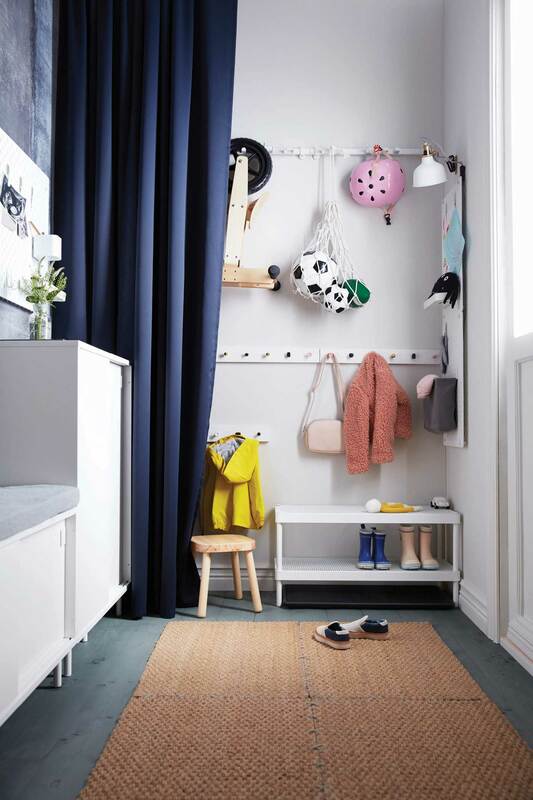 These options from IKEA are easy to use and affordable. Photograph courtesy of IKEA. 6 Tips for Home Organizing from Karen Allbright of Calm Order Inc.